LEICESTER CITY HAVE sacked manager Claudio Ranieiri just nine months after the Italian guided the club to a shock Premier League title win. The champions are in danger of suffering an embarrassing drop to the English Championship as they are currently languishing in 17th position of the Premier League, one point above the relegation zone. The timing of the news comes as quite a shock considering Leicester earned a respectable 2-1 defeat away to Sevilla in their Champions League last-16 first-leg tie last night. But in a statement released by the club this evening, vice chairman Aiyawatt Srivaddhanaprabha indicated that protecting their “long-term interests” was behind the decision. “This has been the most difficult decision we have had to make in nearly seven years since King Power took ownership of Leicester City,” Srivaddhanaprabha said. “But we are duty-bound to put the club’s long-term interests above all sense of personal sentiment, no matter how strong that might be. “It was never our expectation that the extraordinary feats of last season should be replicated this season. Last season was the freak for @LCFC not this 1! Fighting relegation is the norm for them over the yrs. Start on the statue in the morning! The Foxes’s next assignment is a Monday night Premier League fixture against Liverpool. Assistant manager Craig Shakespeare and first-team coach Mike Stowell will take charge of the squad until a new manager is appointed. Email “Leicester City sack Claudio Ranieri just 9 months after winning Premier League”. 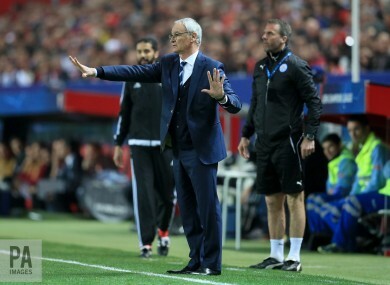 Feedback on “Leicester City sack Claudio Ranieri just 9 months after winning Premier League”.